Rotherham hope to make a signing early this week after boss Paul Warne revealed his meeting with a player went well. 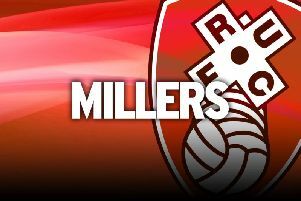 The Millers, battling injuries and suspension, are desperate for bodies in the January transfer window in a bid to keep their heads above water in the Championship. Warne prepared for his side's 7-0 FA Cup mauling at Manchester City by meeting a potential target for a coffee on Saturday and reported that the player told him he wanted to join. The move is now in the hands of the money-makers, but Warne, who met another target on Monday, is confident. “It went well. I am meeting another one tomorrow,” he said. “With the numbers in I need to get some bodies in, especially in the middle of the park. “It went really well, I think the lad wants to come but then all the boring stuff isn't anything to do with me. “I had a coffee with him for three hours, showed him how we wanted to play, how he'd fit into the team and I asked him to think about it for a few days and see if he wanted to come. Warne, perhaps wisely, did not invite the player to come and watch the Millers take on the English champions in the FA Cup on Sunday. Warne's side went down to their heaviest defeat since 1995, but there was no shame in losing to a side that cost £390million to assemble. Global stars Raheem Sterling, Gabriel Jesus, Leroy Sane and Riyad Mahrez were just some of the names to get on the scoresheet. “I didn't invite him to the game, I am not as stupid as I look,” Warne added. “He will see the scoreline, but I am not embarrassed by the scoreline at all.